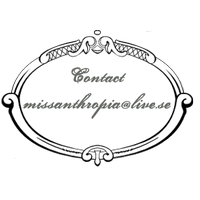 I can`t believe I have been away from my blog for such a long time. My plans are to continue writing and I feel a bit better these days so hopefully I can start blogging on a more regular basis. So what is new since last time? I have gotten an early start to my "high season working" witch means that I probably am working a bit more than 100% ! Ugh! I am trying to see the positive in it, more money! My other half and I was on a small trip to Norway to visit my parents a couple of weeks ago. It was really nice and we even had an awesome day in Oslo with a bit of shopping and looking around. I have been shopping a tiny bit lately. Mostly make up with sensible price tags. 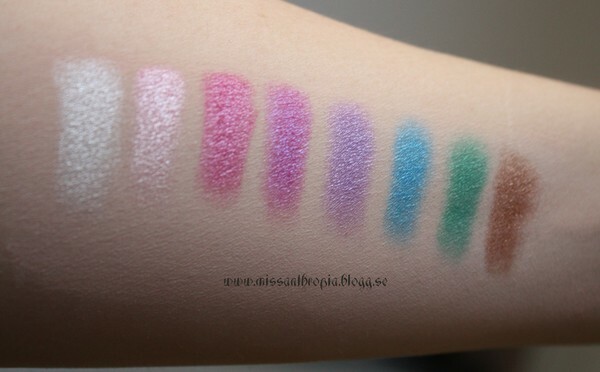 I have swatched it all today! Phew.. 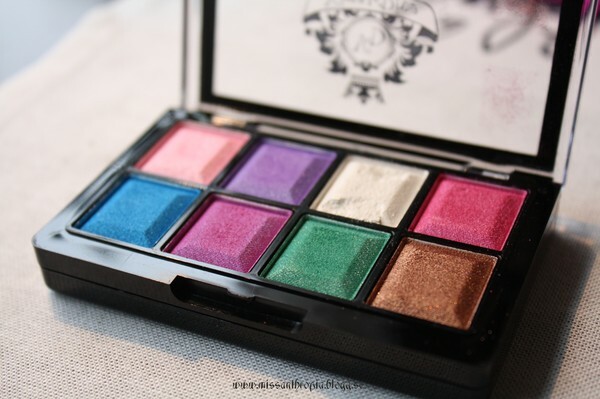 Lets start with the Viva la diva make up! I have been looking at this brand for a long time but not gotten around to buying anything before now. They have really low prices and lots of fun colors. 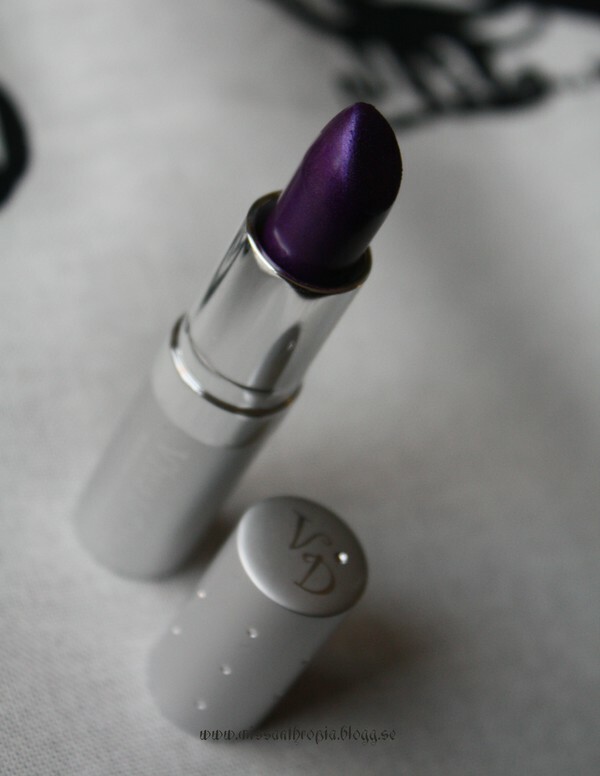 I went with a purple lipstick just because I love purple. I don`t know how much I will wear it out but I will certainly rock it at home. 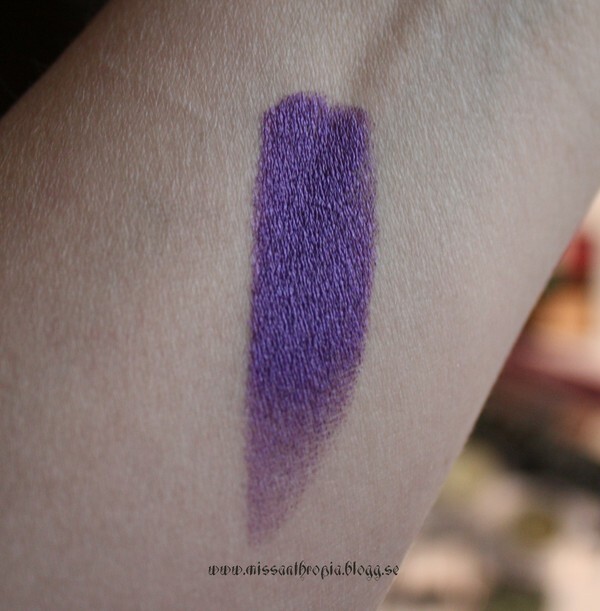 It is really pigmented and have a shimmery/metallic finish and smells like some kind of yummy berries. Maybe I can show it on my lips on a later post but at this time my lips aren`t in the best shape and it will not look good. 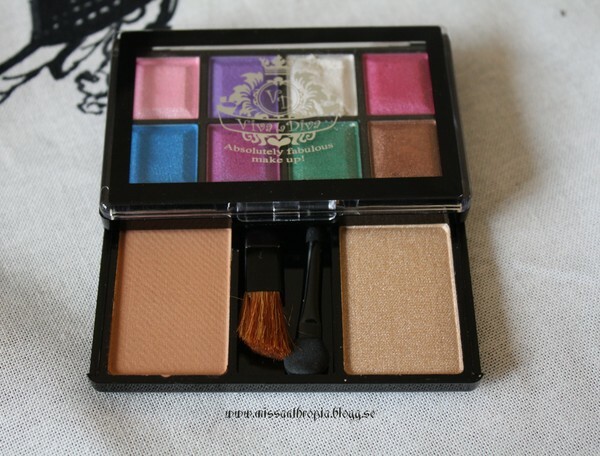 I also bought this colorful palette. Mostly I bought it because of the green witch is awesome in real life. 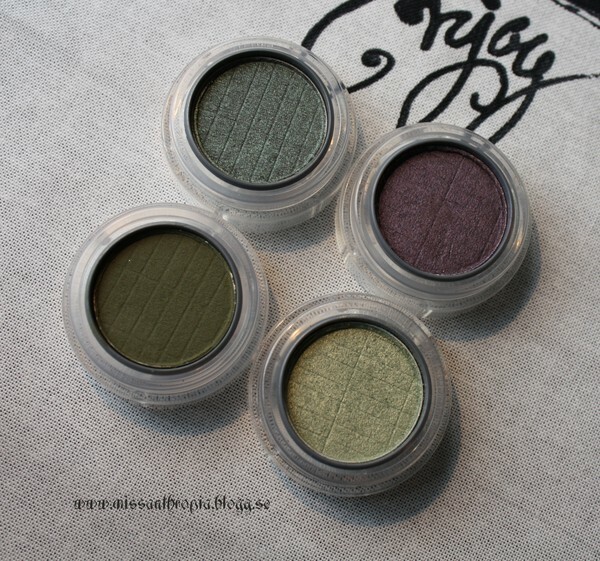 You will notice there are a lot of green eyshadows coming up....I am on a mission to find the perfect one! I was really surprised of how pretty they all looked on. 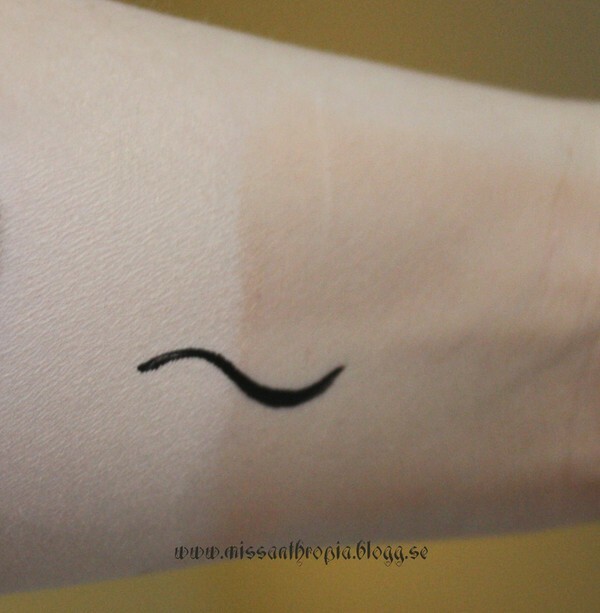 Nice pigmentation and easy to work with. When I got home I noticed that there where one more compartment in the palette! The hidden colors where really nice too! I think they are supposed to be highlighter and bronzer? 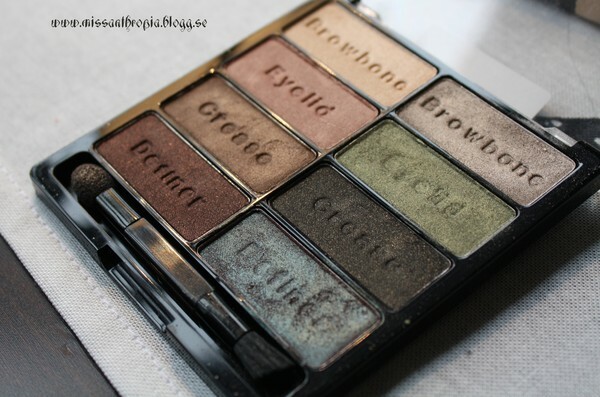 but will serve nice as eyeshadow on my pale skin. 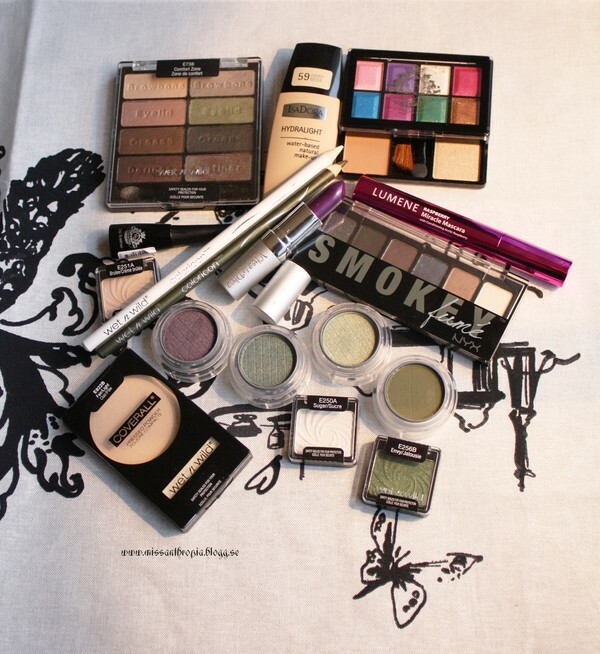 I will start with the palette. As you can see I have been using it for a while already! 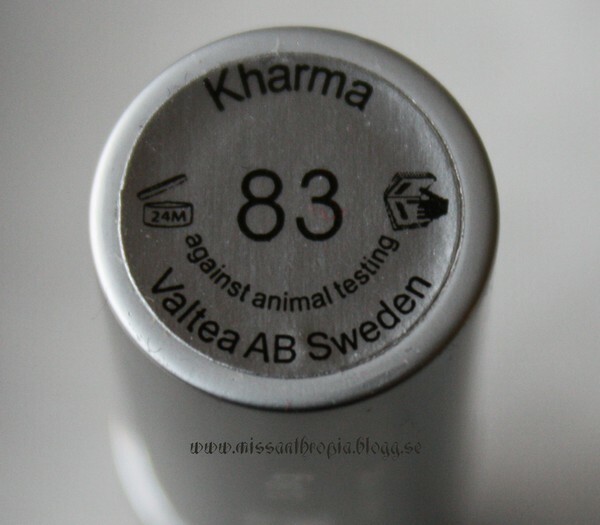 It is perfect for my everyday make up at work when it can`t be heavy. 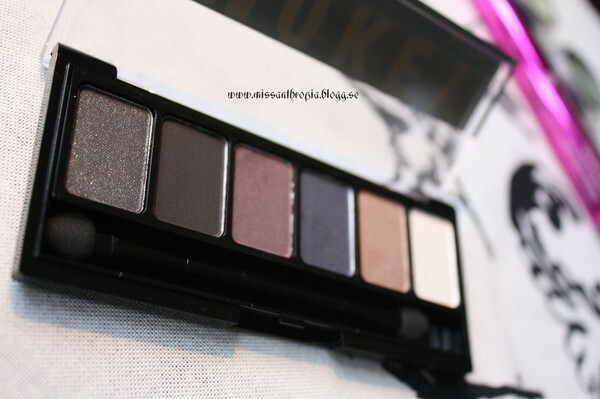 It`s not as pigmented as I would have liked but still a real great bargain. And I am crazy in love with the duocrome at the bottom right. It shifts between a pretty blue/grey/green? metallic shade and a pretty brown color. By the way, all swatches are on a skin toned mineral primer from E.L.F! 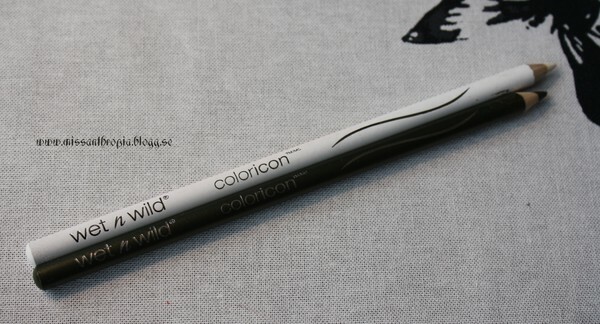 And these two eyeliner pencils. Sadly my swatch on these are not the best but I think you get the idea. 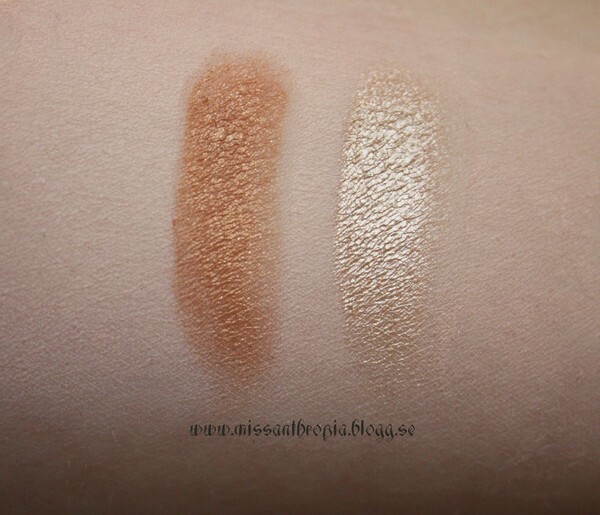 The brulee and Sugar single eyeshadows blends in with my primer and doesn`t really show.. The green Envy is super though! 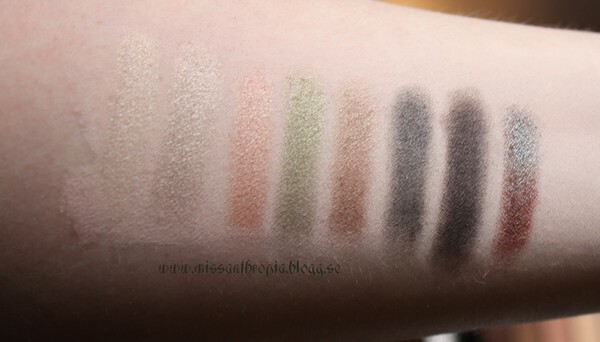 It don`t look good on the swatch but I probably will use this one a lot, Its a really pretty green with metallic in it. Big love! The pencils are better than expected too. 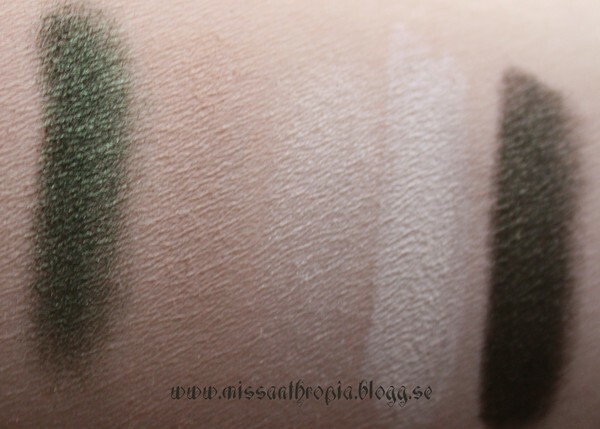 The dark one shows more like a army green in real life and I will use it as a eyeliner when I think black will be to hard looking. 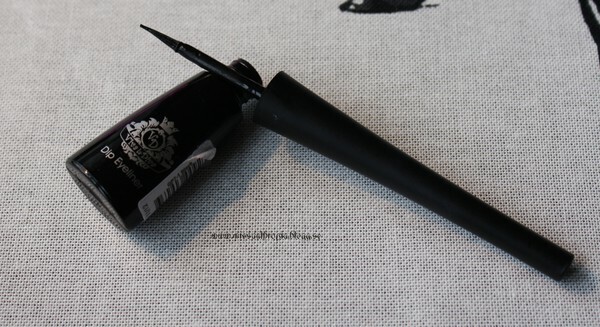 My eyeliner from elf was near empty and going dry so I decided to try this dipliner from viva la diva too. 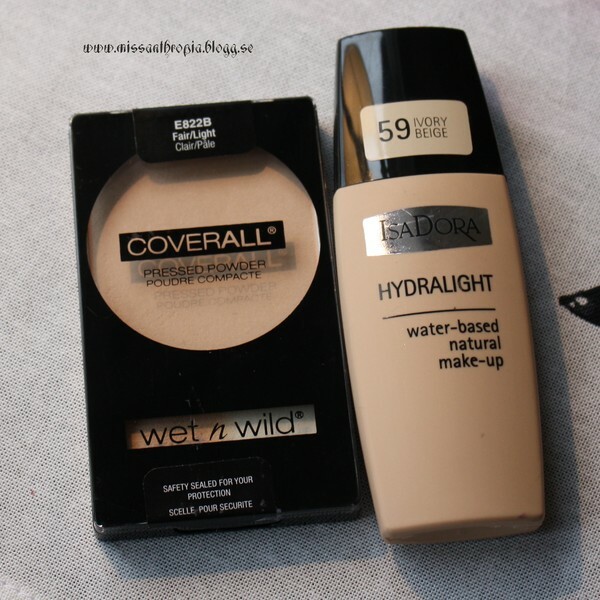 Here is more of the wet n wild i bought, powder. And a new foundation from Isadora. As you can see the dipliner is nice and black and has a good soft tip/brush. 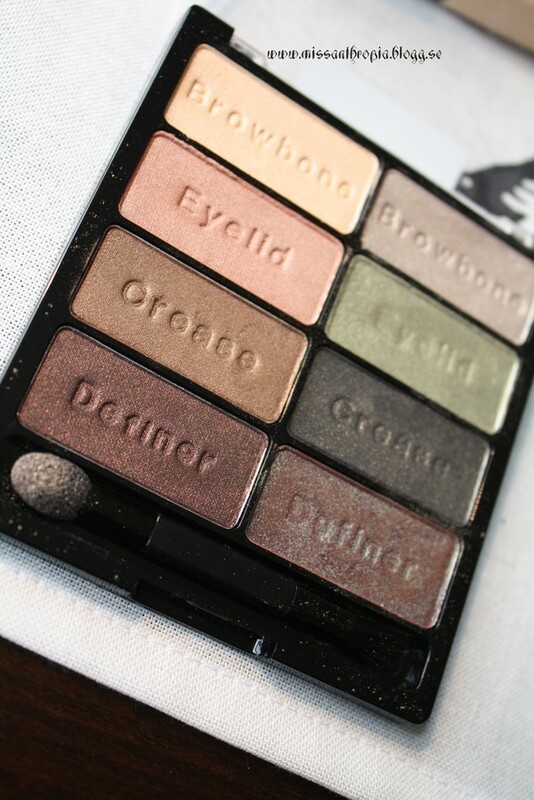 It`s not the best i have tried ( I like the one from elf better) but will serve me good in my everyday use. 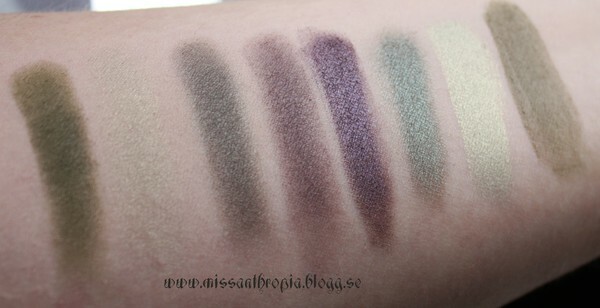 In Oslo I bought this Nyx palette at half off. 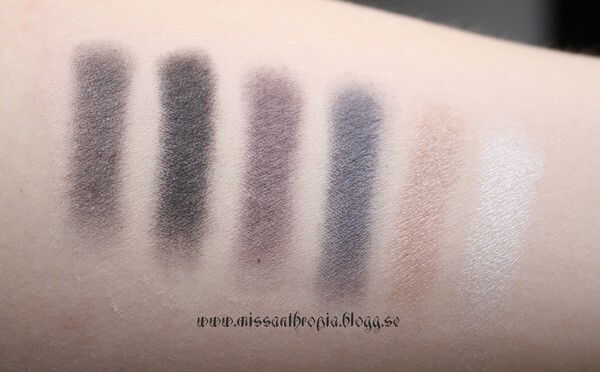 They didn`t look very highly pigmented on my swatch so I actually tried them with some water too. They look so much better when used wet, with the exception from the matte green. Dry on the left and with water on the right. 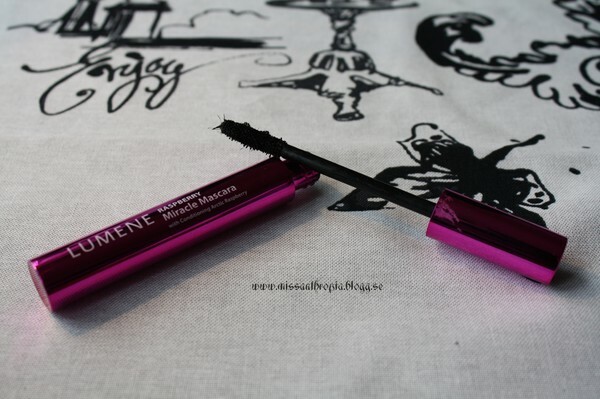 Last in line is the mascara from Lumene. I don`t know what made me try a new one...But it promised so much. Long and volumus lahes. Yes please. But is was nothing more than ok for me. Weirdest wand ever. Looks like a dog chewed on it! 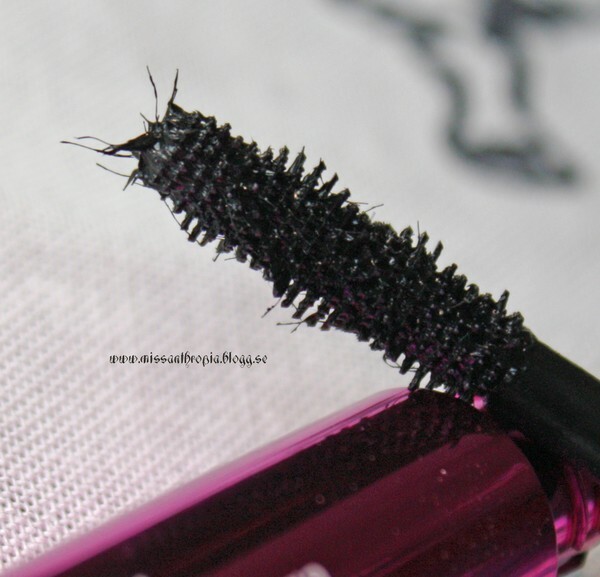 Hi, where did you buy NYX in Oslo?? I've been looking soo much for this brand! !